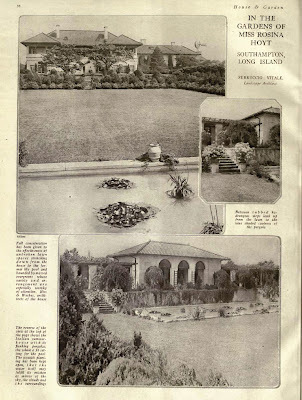 'Red Maples', the estate of Alfred William Hoyt designed by Hiss & Weekes c. 1908 in Southampton with landscaping by Ferruccio Vitale. Alfred and his father were members of the banking firm A.M. Hoyt & Company. In the middle of construction A.W. Hoyt died and his mother and sister (both named Rosina) completed the house. The Hoyts occupied the estate until the elder Rosina's death in 1922 and the house was eventually rented to Marjorie Merriweather Post and her husband at the time E.F. Hutton. From there it went through a number of subsequent owners including one who gave it an Art Deco renovation. The house was demolished in the late 1940s (but stood at Halsey Neck Lane and Ox Pasture Road). Click below to see where 'Red Maples' stood in a 1954 aerial shot before the surrounding area was developed. 1) The recent book on Ferruccio Vitale has several good pictures of the gardens (and there are others to be found on the internet, including color postcards!). 2) I *think* one of the outbuildings still exists. I *think* it was converted into a residence about the time the main house was torn down. 4) Vitale also did the gardens at Four Winds, the house later built by RSH and her husband, Beekman Hoppin. That house still exists, but the property has been heavily subdivided and Vitale's gardens were destroyed. first of all - thanx zach for street names. i'd really like to see the art deco theme and the whole layout with all the water features. sounds really interesting. another interesting one gone. i take it this was just a Post way station on their way to Hillwood. another thing i can't understand about these developers is that the people that built these wonderful places went to great pains to plant the grounds with incredible horticultural specimens but when they sold the lots, they ripped all these out. WTF!! i guess i should understand as they do the same thing up here in the country. they buy a lot, strip every living thing off it, build a mcmansion and then buy sugar maples and pines for $200 a pop. at that rate, their lot was originally covered with $3 million worth of trees. go figure. P.S. Some of the garden features at Red Maples were ultimately moved to Four Winds. In the late 1960s, they were moved again to other Hoyt family houses. (Though a rather nice statue of Diana -- no, not the missing one -- is now hidden away in a garden on Murray Hill.) So not quite everything was "destroyed." The house was torn down, by the last owner's estate. Too bad, it was really one of the best houses in Southampton, very large, like a Newport house. There is great coverage on it in the book, " Houses of the Hampton's, 1880-1930", with floor plans. The architects also did the knollwood estate, in syosett/Muttontown, also known as the King Zog estate and Vitale did those gardens too. i know you'll tell me it was built in january, but what's that huge brick one right across the street? unlike most modern ones, it seems to have a lot of older touches such as a formal garden and a nice pool house and outbuildings. considering the number of outbuildings from red maples that are left and the fact they did nothing with the property, its too bad they couldn't have left the house too. On which street? The house entrance was on Ox Pasture. the property was bordered by Ox Pasture on the north, Great Plains on the south and halsey neck on the west. If you go to google earth or any of the maps, you can see where the house stood, it's an empty lot, surrounded by new houses. It's not a re-creation actually, but an entirely new design, in a new location on the site, with unique facades and floor plan that are quite distinct from the original house. Its only similarity to the original Red Maples is its use of stucco and Spanish Tile roofing. Agree however that it is quite beautiful.